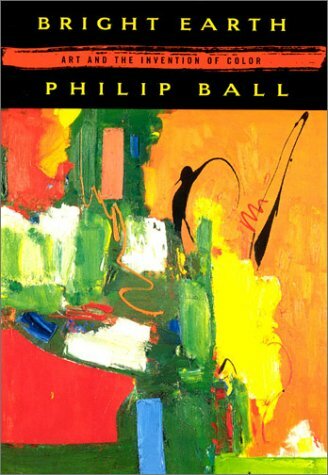 Bright Earth -- a book that I had no knowledge of except that it had ended up on my Reading List, and somehow thought was going to be a novel set in India -- turns out to be a history of the pigments used in artists' paints. It was an eye-opener, even literally I suppose. I had never really thought about the character of art being influenced by the available materials. I hope I am not alone in having unthinkingly sort of assumed that all pigments were available to all artists everywhere, and that color choices in art were pretty much just a matter of culture and aesthetics. I had another think coming. The book begins with a brief outline of the science, physics, and chemistry of color, then progresses more or less chronologically from antiquity to the early 20th Century. Then, there is an especially interesting chapter on how and why paintings decay over time and another on art prints in reproduction. Ball closes with a pair of weaker but necessary chapters on new pigments in the paintings of the last 100 years and the use of color in newer, non-painted media. It is in many ways a fun and thought-provoking book. Its strength, it must be said, is not in showing how the range of available of pigments in particular times and places influenced the history of art. Ball often gestures towards this kind of analysis, but outside of a very few cut-and-dried examples -- the wealthier Renaissance patrons liked their painters to use a lot of Ultramarine because it was conspicuously expensive -- it turns out to be pretty tough to draw many strict causative arrows from the materials to what ended up getting painted. Turns out that culture and aesthetics are pretty key, after all. Yet there is still a lot to like in the Ball's materials-focused history. It is, for one thing, rich in quirky anecdotes. Chasing down the trail of paint history takes him through dazzlingly dense thickets of color linguistics, the lore and actual practice of alchemy, the early history of chemistry as a science, and the emergence of the chemical industry. Throw in centuries of quirky artists, and you've got a lot of great stories. Ball tells them well and -- a skill lacking in many modern non-fiction writers -- knows how to employ a long quotation to solid effect. Too, looking at the paint shows new aspects of the paintings. I have, again naively, always thought of a painting being essentially a two-dimensional array of colored fields and figures. Ball shows how many pictorial effects are achieved through the layering of paints, with underpainting determining the overall tone of a piece and layers of translucent overpainting changing the character of a opaque original layer. It literally adds a new dimension -- depth -- to my conception of the painted surface. Finally, for each historical period he covers, Ball tosses in a little capsule summary of the era's traditional art history. While not strictly necessary for a history of paint, these are so apt and engagingly written that they are a welcome addition to the text. Bright Earth is not, after all, a book with a powerfully argued thesis, nor does it provide anything like comprehensive coverage of any specific topic. It's really more of a scrapbook about paint, the painters who used them, and the industrial, proto-industrial, and chemical processes that brought them into being. It is an excellent leisure read for anyone who loves color, art, or looking at history from a new and unexpected angle. NEXT UP: On the now-randomized Reading List: Albert Camus' The Stranger. Far out.